Dubai: You could not ask for a more exciting race. 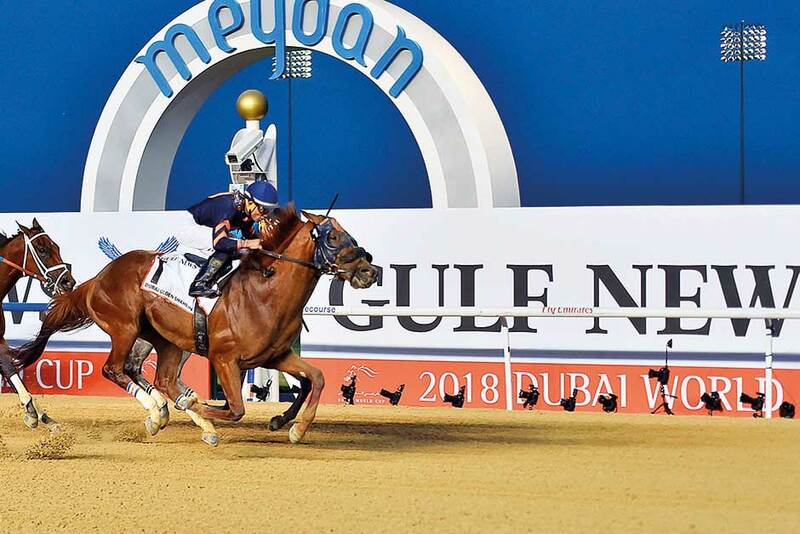 When Mind Your Biscuits put his nose in front within two strides he had won the Golden Shaheen sponsored by Gulf News having been last for much of the race. At the beginning of the straight, victory for Chad Brown’s flyer was unlikely but he did it to become the second horse to win this race twice after Caller One did it in 2001 and 2002. He also notched the fourth course record of the night completing the 1,200m in 1 minute 10.12 seconds. When the gates burst open, My Catch broke quickly but it was Jordan Sport from Gate 9 who managed to get himself to the front and he ran very freely under Adrie De Vries. XY Jet was cruising in behind and came up alongside him and these two blazed a trail until 500 metres out when XY Jet powered forward to the lead in what looked like a race-winning move. Roy H was quickly in pursuit but could never quite get to him. This looked to be the result with Wild Dude really running on nicely behind them. But from nowhere with the most electric turn of foot, Joel Rosario had managed to get a tune out of Mind Your Biscuits and he closed down the other runners to win by a head as he hit the front. It was fabulous and Chad Brown’s charge had secured his place in history. Brown said: “He is an amazing animal and I think we surprised a lot of people. This year we came out with a mission. We could have gone for an easy race in the Godolphin Mile. We wanted to race, we wanted XY Jet and take nothing away from them, they are unbelievable animals they came up with their best racing and we came up on top today. Lets hope they come back next year for a crack a the three-peat and to set another record. They might hope it is less dramatic than this time round.